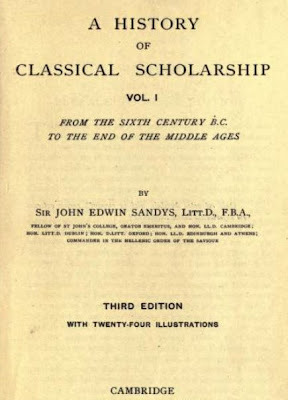 John Edwin Sandys - A History of Classical Scholarship: From the Sixth Century B.C. to the 19th Century. Vol. 01: From the sixth century B.C. to the end of the Middle Ages. Book 01: The Athenian Age, c. 600 - c. 300 B.C. Chronological Table, down to 300 B.C. Cap. 02: The Study of Epic Poetry. Homer and the rhapsodes. Solon, Peisistratus and Hipparchus. Early interpolations. Influence of Homer on early Greek poets. Homer and the Sophists. Allegorical interpretation of Homeric mythology. Homer in Plato, Aristophanes and Isocrates. Quotations from early "editions" of Homer. Aristotle on Homer. The Study of Hesiod, Antimachus and Choerilus. Cap. 03: The Study of Lyric Poetry. Plato and the study of poetry; vase-painting by Duris. "Lyric" and "melic" poets. The study of the "melic", elegiac, and iambic poets. Cap. 04: The Study and Criticism of Dramatic Poetry. Literary criticism in Attic Comedy. The text of the Tragic Poets. Quotations from the dramatists. Dramatic criticism in Platon and Aristotle. Cap. 05: The theory of poetry in Homer, Democritus, Plato and Aristotle. Aristotle's treatise on Poetry. Cap. 06: The Rise of Rhetoric, and the Study of Prose. Plato's Gorgias and Phaedrus. Aristotle's Rhetoric. Aristotle's relations to Isocrates and Demosthenes. Literay criticism a branch of Rhetoric. Place of Prose in Athenian education. Early transmision of the work of Plato and Aristotle. Libraries in the Athenian age. Cap. 07: (I) The Beginnings of Grammar and Etymology. Early speculations on the origin of language. Plato's Cratylus. Grammar in Aristotle. (II) History and Criticism of Literature in the Peripatetic School. Theophrastus, Praxiphanes and Demetrius of Phaleron. Book 02: The Alexandrian Age, c. 300 - 1 B.C. Chronological Table, 300 - 1 B.C. Cap. 08: The School of Alexandria. The Library and the Librarians. Philetas. Zenodotus. Alexander Aetolus. Lycophron. Callimachus. Eratosthenes. Aristophanes of Byzantium. Aristarchus. Callistratus. Hermippus. Apollodorus of Athens. Ammonius. Dionysius Thrax. Tyrannion. Didymus (Tryphon. Theon). Cap. 09: The Stoics and the School of Pergamon. The Grammar of the Stoics. The Pergamene Library. Polemon of Ilium. Demetrius of Scepsis. Crates of Mallos. Pergamon and Rome. Apollodorus of Pergamon. Athenodorus. Alexander Polyhistor. Demetrius Magnes. Alexandria and Pergamon. Athens and other seats of learning. Book 03: The Roman age of Latin Scholarship, c. 168 B.C. - c. 530 A.D.
Cap. 10: Latin Scholarship from the death of Ennius (169 B.C.) to the Augustan Age. Greek influence before 169 B.C. The battle of Pydna and Crates of Mallos (168 B.C.). Accius. Lucilius. Histories of Rome written by Romans in Greek. Aelius Stilo. Varro. "Analogy" and "Anomaly" from Varro to Quintilian. The influence of Greek studies on Cicero; on Lucretius, Catullus, Cinna and Varro Atacinus; on Caesar, Nepos and Sallust; on Virgil, Horace, Gallus, Propertius and Ovid; and on Pompeius Trogus and Livy. Cap. 11: Literary Criticism and Grammar in the first century B.C. Literary Criticism in Varro, Cicero and Pollio. Atticus and Tiro. Nigidius Figulus. L. Ateius Praetextatus. Valerius Cato. Grammatical Terminology. Literary Criticism in Horace. Early Study of Virgil and Horace. Chronological Table, 1 - 300 A.D.
Cap. 12: Latin Scholarship from the Augustan Age to 300 A.D. Hyginus. Fenestella. Verrius Flaccus. Palaemon. The two Senecas. Petronius. Persius. Asconius. Pliny the Elder. Probus. Quintilian. Tacitus. Pliny the younger. Martial. Juvenal. Statius. Suetonius. Grammarians. Fronto. Gellius. Terentianus Maurus. Pompeius Festus. Acro and Porphyrio. Censorinus. Chronological Table, 300 - 600 A.D.
Cap. 13: Latin Scholarship from 300 to 500 A.D. Nonius. Ausonius. Paulinus. Symmachus. The Study of Virgil. Victorinus. Aelius Donatus. Charisius and Diomedes. Servius. St. Jerome and St. Augustine. Macrobius. Martianus Capella. Recensions of Solinus, Vegetius and Pomponius Mela, and abridgement of Valerius Maximus. Apollinaris Sidonius. School of learning in Gaul. Grammarians and Commentators. Recension of Virgil by Asterius. Cap. 14: Latin Scholarship from500 to 530 A.D. Boethius. Cassiodorus. Benedict and Monte Casino. Priscian. Book 04: The Roman age of Greek Scholarship, c. 1 - c. 530 A.D.
Cap. 15: Greek Literary Criticism in the Firts Century of the Empire. Dionysius of Halicarnas. Caecilius of Calacte. The Treatise of the Sublime. Demetrius. Cap. 16: Verbal Scholarship in the Firts Century of the Empire. Juba, Pamphilus and Apion. Minor Grammarians. Cap. 17: The Literary Revival at the end of the First Century. Dion Chrysostom. Plutarch. Favorinus. Cap. 18: Greek Scholarship in the Second Century. Hadrian. Herodes Atticus. M. Aurelius. Arrian and other historians. Philon of Byblus. Phlegon of Tralles and Ptolemaeus Chennus. Pausanias. Literary rhetoricians: Aristides and Maximus Tyrius; Lucian and Alciphron. Technical rhetoricians: Alexander, Aelius Theon and Hermogenes. Grammarians: Apollonius Dyscolus, Herodian and Nicanor. Lexicographers and "Atticists": Phrynicus, Moeris, Harpocration and Pollux. Hephaestion. Symmachus on Aristophanes. Commentators on Plato. Galen. Sextus Empiricus. Clement of Alexandria. Cap. 19: Greek Scholarship in the Third Century. The Philostrati and Callistratus. Aelian. Athenaeus. Rhetoricians: Apsines, Minucianus, Menander and Longinus. Diogenes Laertius. Alexander of Aphrodisias. Rise of Neo-Platonism. Origen. Plotinus and Porphyry. Aristides Quintilianus. Cap. 20: Greek Scholarship in the Fourth Century. Eusebius. Dexippus, Himerius, Themistius, Libanius and Julian. Quintus Smyrnaeus. Theodosius, Ammonius and Helladius. Cap. 21: Greek Scholarship from 400 to 530 A.D. Poets, Historians and Philosophers. Hypatia, Synesius and Palladas. Neo-Platonists: Plutarchus, Hierocles, Syrianus, Proclus, Hermeias, Ammonius and Damascius. The School of Athens closed by Justinian (529). Simplicius and Olympiodorus II. "Dionysius the Areopagite". Grammarians, Lexicographers, Autors of Chrestomathies and Rhetoricians. Schools of learning in the East. The end of the Roman Age (529). Book 05: The Byzantine age, c. 530 - c. 1350 A.D.
Chronological Table, 600 - 1000 A.D.
Cap. 22: Byzantine Scholarship from 529 to 1000 A.D.
Period I (529 - 641). Choeroboscus. Stephanus of Alexandria. The Chronicon Paschale and Malalas. Period II (641 - 850). John of Damascus. Theognostus. The study of Aristotle among the Syrians and Arabians. Period III (850 - 1350), part i (850 - 1000). The Classics in the Ninth Century. Photius and Arethas. The encyclopedias of Constantine Porphyrogenitus. The Anthology of Cephalas. The lexicon of Suidas. Chronological Table, 1000 - c. 1453 A.D.
Cap. 23: Period III continued. Byzantine Scholarship, 1000 - 1350 A.D. and after. Psellus. Commentators on Aristotle. Etymological and other Lexicons. Tzetzes. Theodorus Prodromos. Eusthatius. Gregorius Corinthius. The Latin conquest of Constantinople (1204). Constantinople and the West. Scholars under the Paleologi: Planudes, Moschopulus, Thomas Magister, Triclinius and Chrysolaras. Characteristics of Byzantine Scholarship. The Greek Classics in and after Century IX. Their preservation in the Byzantine Age. The Turkish conquest of Constantinople (1453). Book 06: The Middle Ages in the West, c. 530 - c. 1350 A.D.
Cap. 24: Gregory the Great. Gregory of Tours. "Virgilius Maro", the Grammarian. Columban and Bobbio, Gallus and St. Gallen. Isidore of Seville. Greek in Spania, Gaul, Italy, and Ireland. Theodore of Tarsus. Aldhelm. Bede. Boniface and Fulda. Cap. 25: Charles the Great and Alcuin. Theodulfus of Orleans. The Irish monks, Clement, Dungal and Donatus. Einhard. Rabanus Maurus. Walafrid Strabo. Servatus Lupus and the Classics. Joannes Scotus. Eric and Remi of Auxerre. The Classics at Pavia, Modena and St. Gallen. "The monk of Einsiedeln". Ecclesiastical use of Greek. Hucbald and Abbo "Cernuus". Alfred the Great and his translations. Cap. 26: The Tenth Century. Regino of Prüm and Ratherius of Liège. Gesta Berengarii. Odo of Cluni. Bruno. Gunzo. Hroswitha. Hedwig and Ekkehard II. Walther of Speier. Gerbert, Fulbert and Richer. Luitprand. Abbo of Fleury. Aeltric of Eynsham. Chronological Table, 1000 - 1200 A.D.
Cap. 27: The Eleventh Century. Chartres, St. Evroult and Bec. Bamberg and Paderborn. Lambert of Hersfeld and Adam of Bremen. Notker Labeo and Hermannus "Contractus". Anselm of Bisate. Desideius, Alfanus and Petrus Damiani. Greek in the eleventh century. Greek Lectionary of St. Denis. Dudo of St. Quentin. Carthusians and Cistercians. Cap. 28: The Twelfth Century. The early Schoolmen and the Classics. The Scholastic Problem; Realism and Nominalism. Medieval knowledge of Plato; and of Aristotle prior to 1128 A.D. Lanfranc and Anselm. Abelard. Bernard of Chartres, William of Conches, Adelard of Bath, Gilbert de la Porree. Otto of Freising. Theodoric of Chartres. Bernard Silvester of Tours. Cap. 29: The Twelfth Century continued. John of Salisbury. Peter of Blois. Giraldus Cambrensis. Natives of England, who wrote historical Latin Prose in Centuries XII - XIV. Latin Verse in Centuries XII - XIII, in Italy, England, France and Germany. Greek in France, Germany, Italy and England. Chronological Table, 1200 - 1400 A.D.
Cap. 30: The Thirteenth Century. The new Aristotle. Arabian and Jewish exponents of Greek philosophy. Latin translations from the Arabic. Early study of Aristotle in Paris. Alexander of Hales. Edmund Rich. William of Auvergne. Grosseteste. Vincent of Beauvais. Albertus Magnus. Thomas Aquinas. William of Moerbeke. Siger of Brabant. Gilles de Paris. Geoffrey of Wateford. Cap. 31: The Thirteenth Century and after. (1) Roger Bacon. Raymundus Lullius. Duns Scotus. William Shirwood. William of Ockham. Walter Burley. Bradwardine. Richard of Bury. Buridan. Jean de Jandun. (2) Irnerius and Accursius at Bologna; Balbi of Genoa; Petrus of Padua. The teaching of Greek, and the study of Latin Aristotle, in Paris. Precursors of the Renaissance in Northern Italy. The Latin studies of Dante. Cap. 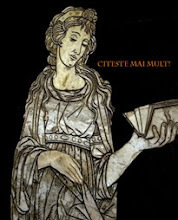 32: The mediaeval copyists and the Classics. Survival of the Latin Classics in France, Germany, Italy and England. Rise of the mediaeval Universities. 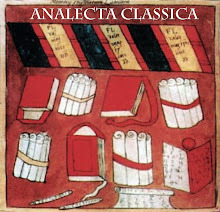 Survey of the principal Latin Classics quoted or imitated in the Middle Ages, recorded in mediaeval catalogues, and preserved in mediaeval Manuscripts. Grammar in the Middle Ages. The study of the mediaeval "Arts"versus the study of the Classical Authors. The conflict between the grammatical and literary School of Orleans and the logical School of Paris. The Battle of the Seven Arts (after 1236). The prophecy of the author of that poem fulfilled by the birth (in 13904) of Petrarch, the morning-star of the Renaissance.